Golden salty breadsticks, painted with salt, with just the right amount of crunch. These are the perfect appetizer. Ideal for those of you who like bread. You’ll want to eat one after another, after another. 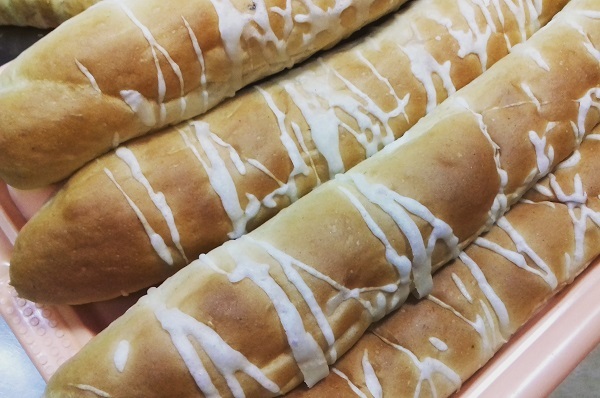 However, if you’re controlling the amount of bread you consume, these gluten-free breadsticks are your friend. Use a handheld whisk to combine well. Add the salt, and whisk to combine. Add the butter and water, and mix on low speed with the dough hook until combined. Raise the mixer speed to medium and knead for about 5 minutes. The dough will be quite sticky, but should be smooth and stretchy. Spray a silicone spatula lightly with cooking oil spray, and scrape down the sides of the bowl. Line a rimmed baking sheet with unbleached parchment paper and set it aside. Divide the dough into 12 pieces of equal size. Fold the rectangle along the length halfway, from bottom to top, and top to bottom. Roll the dough back and forth on the lightly floured surface to seal the edges well, and to elongate it slightly. Dough should be about 7 inches long. Place the shaped dough on the prepared baking sheet, each piece about 2 inches apart from the other. Once all of the breadsticks are shaped, cover the baking sheet with oiled plastic wrap and set in a warm, draft-free location to rise about 1 hour. About 25 minutes before the dough has finished rising, remove the plastic and preheat your oven to 350°F. While breadsticks are in the oven, in a small bowl combine flour, salt and water until completely smooth and of the pancake thickness. Take the breadsticks out of the oven, and decorate with a zig-zag line of salt mixture. Return to the oven and bake another 10 minutes. Take out and wrap in a kitchen towel. Leave to rest at least 30 minutes.